In Monetary Policy Review on Wednesday, the RBI kept all key ranges unchanged. Though this was widely expected, the Equity Markets did not show much enthusiasm as the session remained weaker-than-expected. The benchmark NIFTY50 saw yet another decline and ended the day below but within the filters of the 100-DMA losing 74.15 points or 0.73%. Going into trade tomorrow, the Markets awaits a imminent technical pullback. In most probability, the levels of 100-DMA should hold out as supports at Close levels. Sooner the Markets move past this 100-DMA mark, better it will be able to avoid any serious weakness from creeping in. The levels of 10075 and 10125 will play out as immediate resistance levels while supports come in at 10000 and 9930. The Relative Strength Index – RSI on the Daily Charts is 33.5296 and it has marked a fresh 14-period low which is bearish. It does not show any divergence against the price and rests at Double Bottom support at current levels. No significant formations were observed on Candles. Pattern analysis confirms the levels of 10410 as a lower top for the Markets over past couple of days and the NIFTY has seen a consistent decline. Currently it has ended slightly below the 100-DMA mark but stays within its filters. The levels of 100-DMA remain significant from ways more than one. The NIFTY had crawled back above the 100-DMA mark in the end of January 2017 and has remained above this mark for entire part of 2017 as of now. 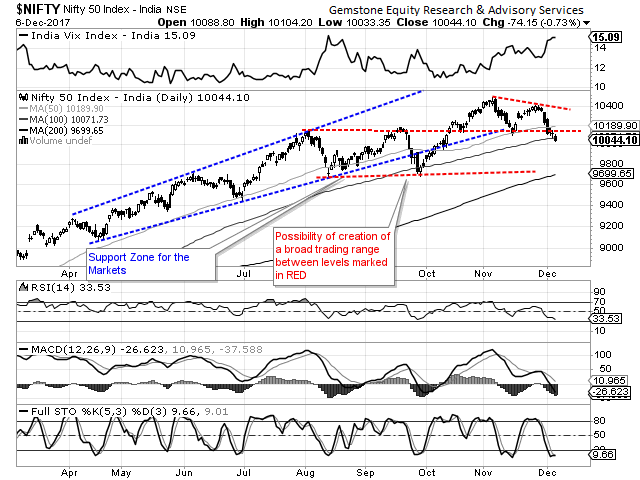 Though there were minor breaches but the NIFTY has continued to take support at this DMA. As of today, the VIX has tested its previous resistance while the lead indicator RSI has marked a Double Bottom support. All this point towards increased possibility of an imminent pullback that the Market is awaiting. To further this, there are also large number of shorts that await covering up at lower levels. Taking a broader view of all these, we recommend avoiding shorts completely and look for bargain purchases at lower levels.